Pages survived: 78Nope. Nope. Nope.It's just that simple. This plot was mediocre, but I'm typically okay with that. The characters were definitely on the dry side, but sometimes I can handle that as well. The author didn't adequately change between the P.O.V.s, but that's sometimes doable, too. When all three elements and issues are thrown together in one book? Nope. I can't handle such at all.And, to add insult to injury, I actually felt myself loosing respect for the heroine and wanting to punch the hero repeatedly in his head. Peter was an asinine man, while Victoria seemed to back down from his jerkish ways more often than not. And, on the occasions where our heroine lead did stand up to Peter, the dialogue was choppy and awkward. Overall, I'm surprised I managed to even read 78 pages of this book, and that's really sad, because on the surface this novel had a lot of potential. PS: Okay, so I know it's probably childish, stupid, and really, really petty...but I have to wonder if I'm the only one who noted Peter's last name and couldn't help but snicker in kid-like amusement? It is Netherwood, after all. 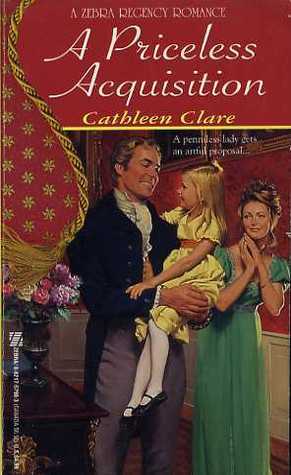 Cathleen Clare - Under the pen name Cathleen Clare, Catherine Toothman wrote l4 novels and had stories included in four anthologies for Zebra Books. Catherine began writing with the July 1992 release of "Mistress of Mishap". Her first book "Lord Scandal's Lady" was her third published book. In addition to writing, Catherine was a librarian at OUSC and before that at the Briggs Lawrence County Public Library. Her interests also ran to horses; she and her husband operated a stable and taught riding until they sold the farm and moved to Ironton, Ohio and she loved to research her books. "If it was in the book, you could take it as fact", a close friend would state.